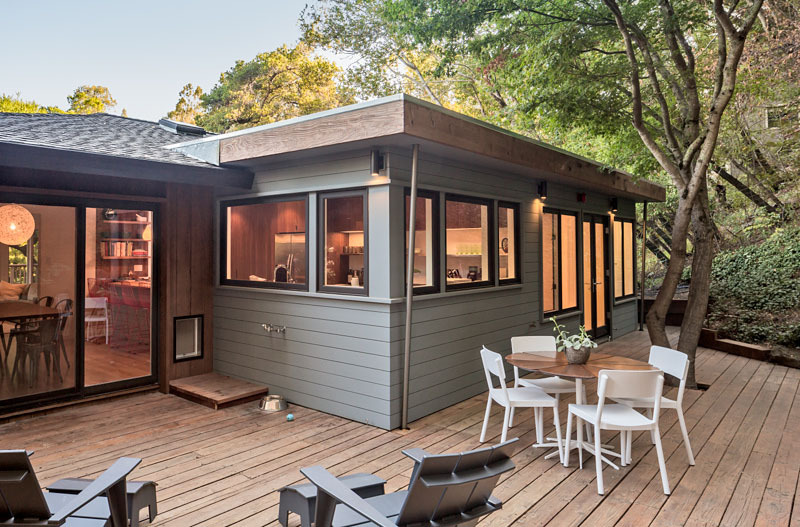 Sited in the woodsey hills of San Anselmo, this house suffered from oddities of scale and organization, as well as a rather low grade of detailing and finish. This design savvy couple saw the property’s potential and turned to building Lab to develop it into a home for their young, growing family. Initial discussions centered on expanding the kitchen and master bath but grew to encapsulate the entire house. With a bit of creative thinking we met the challenge of expanding both the sense of and actual space without the full cost of an addition. An earlier addition had included a screened-in porch which, with the floor and roof already framed, we now saw as the perfect place to expand the kitchen. Capturing this space effectively doubled the size of the kitchen and dramatically improved both natural light and the engagement to rear deck and landscape. The lushly forested surrounds cued the generous application of walnut cabinetry and details. Exposed cold rolled steel components infused the space with a rustic simplicity that the original detailing lacked but seemed to want. Replacement of hollow core six panel doors with solid core slabs, simplification of trim profiles and skim coating all sheetrock refined the overall feel. Ultimately, pretty much every surface - including the exterior - received our attention. On approach, the project maintains the house’s original sense of modesty. In the interior, warmth, refinement and livability are achieved by finding what the house had to offer rather than aggressive reinvention.